Now that we’ve installed Microsoft Security Essentials, the free anti-virus and anti-spyware package on Windows 7, let’s have a quick look at a screen-by-screen overview of the product and available options. Firstly, lets’ take a walk-through all the major tabs which are availabe to us. The Home Tab gives and ovall overview of status information and provides a launching pad for the rest of the program features. 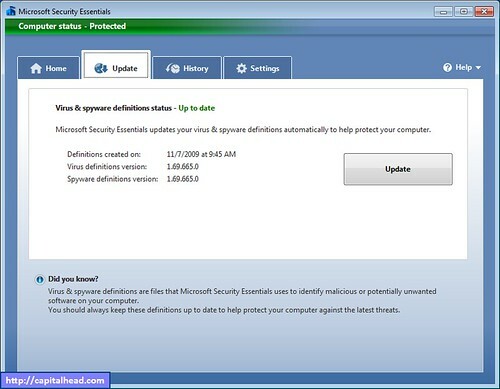 The Update tab shows information related to updates, such as virus and spyware definition version, the time and date virus and spyware definitions were updates as well as a button to start an manual update process. 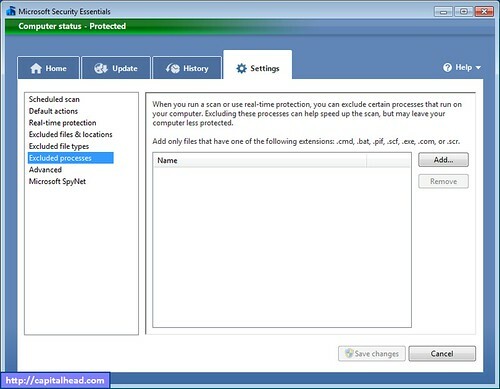 The History tab allows the user to view all detected viruses, quarantined files and items that have been allowed to run even though Microsoft Security Essentials flagged it as malware. The Settings tab allows us to fint-tune Security Essentials and offers many customization options; such as Default actions, Schduled virus scan, real-time protection, excluded files and locations etc. This Scheduled scan dialog allows you to set when a virus scan should start on your computer, what type of scan and whether Security Essentials should check for an update before running the scan. 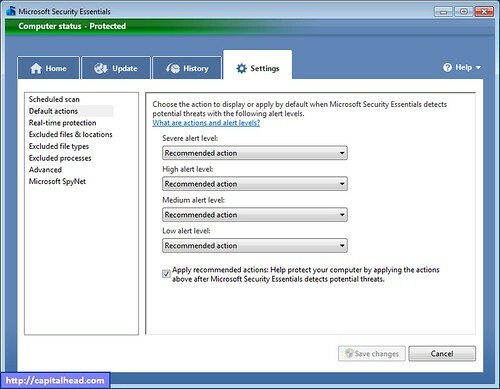 The Default actions dialog allows you to choose the action to display or apply when Microsoft Security Essentials detects potential threats (virus, spyware, malware) depending on the threat level. The Real-Time protection dialog allows you to turn on or off the real-time protection setting. Real-time protection alerts you when viruses, spyware, or other potentially unwanted software attempts to install itself or run on your computer. Excluded files & locations allow you to exclude certain files and locations when you run a scan or use real-time protection. Excluding these files and locations can help speed up the scan, but may leave your computer less protected. Excluded file types allow you to exclude certain file types when you run a scan or use real-time protection. Excluding these file types can help speed up the scan, but may leave your computer less protected. Excluded processes allows you to exclude certain processes that run on your computer when you run a scan or use real-time protection. Excluding these processes can help speed up the scan, but may leave your comptuer less protected. The Advanced dialog allows you to choose if you wish to scan archive files, such as .ZIP or .CAB files; Scan removable drives, such as USB flash drives, for malicious software and unwanted software when running a full scan; Create system restore point - creates a system restore point on your computer on a daily basis before cleaning your computer; and allows you to select the option of whether you wish to allow all users view permission to the History of results. 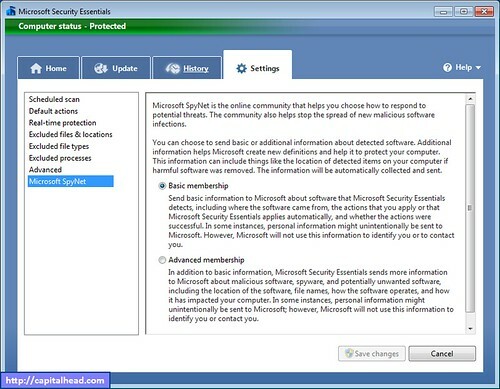 The Microsoft SpyNet dialog allows you to control the level of membership/interaction your computer has with SpyNet. SpyNet is the online community that helps you choose how to respond to potential threats. The community also helps stop the spread of new malicious software infections. 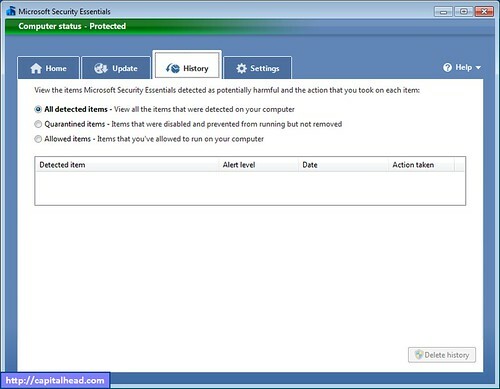 Here you have two options to choose from; (1) Basic membership - Send basic information to Microsoft about software that Microsoft Security Essentials detects, including where the software came from, the actions that you apply or that Microsoft Security Essentials applies automatically, and whether the actions were successful. In some instances, personal information might unintentionally be sent to Microsoft; however, Microsoft will not use this information to identify you or to contact you; (2) Advanced membership - In addition to basic information, Microsoft Security Essentials sends more information to Microsoft about malicious software, spyware, and potentially unwanted software, including the location of the software, file names, how the software operates, and how it has impacted your computer. In some instances, personal information might unintentionally be sent to Microsoft; however, Microsoft will not use this information to identify you or contact you. 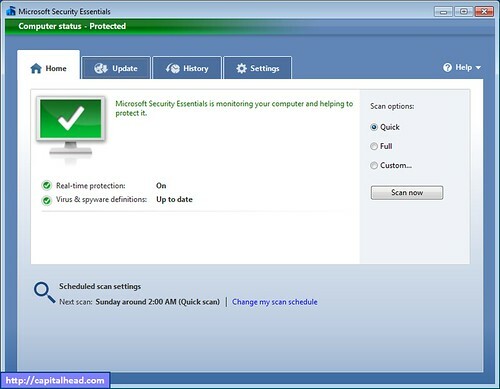 Microsoft Security Essentials, has a clean user interface and works without being obtrusive. 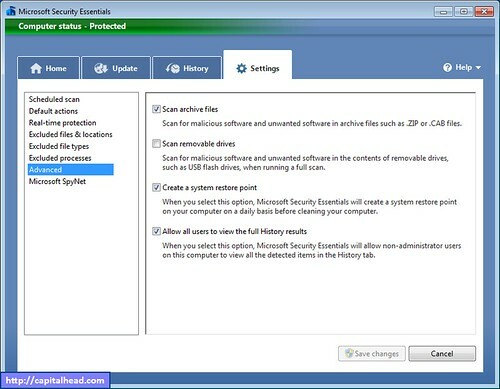 This article gave a screen-by-screen overview of the new and free anti-virus and anti-spyware pacakge from Microsoft.